The Zoe Foundation covered the expenses for Willie and his mate’s transport to the CCI facility. 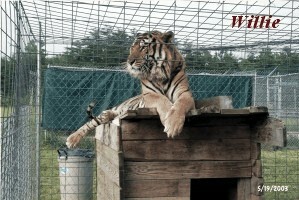 Willie had to spend a short time in a small holding cage while his large, new habitat was being constructed. Mindy Stinner wrote the following story about Willie’s rescue. “Our friends at the Exotic Feline Rescue Center in Indiana knew we had a single female tiger on site who was showing signs of being lonely. 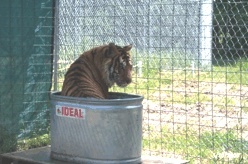 We wanted a companion for Tigra but also wanted to ensure any new tiger on site came from a rescue situation. The EFRC is often overwhelmed by the requests they get to take in large cats, and spring is often the busiest time of year. They called us after they had filled their temporary cages completely and had animals seized by Fish and Wildlife officers waiting in small transport cages for housing to be ready. They refused to accept any more animals until they could catch up with the commitments they had on site. However, they had agreed to take in one older breeding pair of tigers that could not wait. The couple had lived for about seven years at a combination roadside zoo and mini-golf course in northern Alabama. The woman who ran the place had decided to retire and asked her sons, both professional chicken farmers, to place the animals or to euthanize them. They set a final date for pick-up of placed animals, planning to euthanize all remaining animals on site after Tuesday, May 13. EFRC was not about to let these cats get put down but simply had no room for them at their facility. They called us. We had a temporary cage, small but sound, available. We had not planned on needing it so quickly and had not completed the shift cage yet, but agreed these cats needed a home that we could provide. The EFRC agreed to pick them up and deliver them to us, and the Zoe Foundation offered to pay for the gas they used for the transport. We knew little about what to expect except that the cats had been a bonded adult pair before they went to live at the Putt-Putt location. That meant they were roughly ten years old at a minimum. We kept in touch with Jean, the woman in charge of transporting them, via her cell phone during the long hours they attempted to load the cats. The cats would not enter the transport crates no matter how wonderful the bribe. She spent all day on the 13th trying to load them and then asked the owners for one more day before they would be put down. The owners agreed. The following morning they attempted one last time to load the cats, noting that the female seemed lethargic. Since they had not been fed the previous day and the weather was hot and humid, this did not seem alarming. The couple was also mating, meaning we may be taking in a future family instead of a pair. When no other method worked, Jean consulted with the veterinary anesthesiologist at the University of Indiana who recommended dosages for a tranquilizer rifle shot. The owners loaded the darts and tranquilized the cats, who were quickly moved into the transport cages and loaded onto the truck. During the long trip to NC, Jean and the volunteer with her stopped every hour to offer the still-groggy cats water and to check their progress. The male woke up fairly quickly, but the female was slow to become responsive. They arrived late that evening, and we unloaded the cats from the truck. The male, Willie, was more than happy to leave the transport cage and enter his new grassy space. Jean informed us that the cage he had been living in was roughly twice the size of our temporary cage with cement floors. His enormous feet showed signs of long life on cement with pink circles on his toes and cracked pads at the edges where the moisture was sucked away by the cement. He seemed enamored immediately with the grass and flopped down with his face in it, blowing and watching it move. Lilly, on the other hand, had to be prodded to leave the transport cage and was still very groggy. She finally managed to step out of the transport cage and walk the several paces across to a quiet corner of the new space where she quietly lay and put her head down. She did not want water. Willie drank deeply from his new watering tub and splashed a bit, then went to explore his new house. He marked the sides and scratched the porch, then went inside and peered out through side peepholes. Lilly remained where she was. She was too responsive to give fluids at that time and not responsive enough to want to drink on her own. I was worried about her. The couple also looked at bit older than I expected, maybe thirteen or fourteen instead of ten. That meant they may have a harder time processing the anesthetic drugs than a younger cat. I checked late that night on the new arrivals. Lilly had made her way into the den box and was cuddled inside with Willie. He had a huge forearm wrapped protectively over her back, and she was resting her muzzle on his other front leg. He looked up at me and grumbled out a warning…she blinked at me but did not move her head much. First thing the next morning I checked on them, and they were still in the den. Lilly was not responsive at all when I called her name and my stomach clenched in the fear we had lost her. I watched for a moment to see she was still breathing. Then I began to ask Willie to shift into our smaller transport cage so I could help his lady. He was not interested. I got fluids and medications to administer to her and brought them down to the cage along with a wonderful bribe for Willie. I hoped he would shift quickly so I could get to her faster. He grumbled at me from behind her in the den, then got up to see if I had interesting food. When he got up, so did she. I watched her walk unsteadily to the water trough and drink in deep gulps. I felt relief, knowing if she was able to walk and drink, she was probably out of the worst danger. Willie walked over and licked her once, then turned away and went into his den box. He laid down with his face away from the door. Lilly drank for long moments, then she turned and looked at me. She lay down on her belly in the tall green grass and seemed to sigh. She slowly rolled over onto her side as if going to sleep. Her breathing suddenly became very labored. Doug and I went in immediately to check on her. A few breaths and she was gone. Willie was already mourning. He bawled loud tiger cries all that day and into the night. Tigra called to him, and he ignored her. The wolves nearby howled that evening, and he howled with them then, and again in the morning. He was inconsolable. Doug and I were devastated at his loss. Jean was horrified. She had promised them better lives and now Willie was alone in a strange place. We knew there must have been a cause for her to die so suddenly, and we were worried that Willie might be ill, too. The state vet gave us the answers we sought. Lilly had indeed been very ill prior to transport. She had pneumonia as well as other problems, and it had simply been too much for a tiger her age to handle. Willie will be treated as a precaution. Over the next few days we spent a good deal of time near Willie, talking to him and playing near him with other animals in an attempt to rouse his interest. 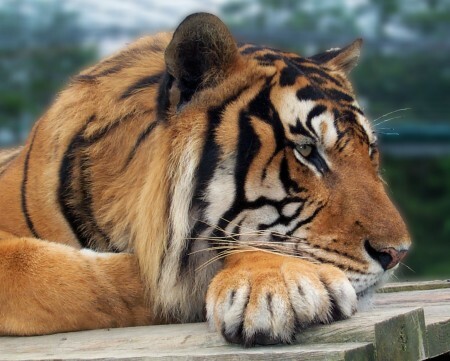 On the fourth day Tigra chuffled to him, and he made the friendly tiger call back to her. His appetite improved. He be began to drag around the big truck tire in his cage, and he even went swimming in the water trough. I couldn’t believe he could fit into it, but he managed to sit down into it like an older gentleman getting into a hot tub. I watered his shoulders, and he seemed to enjoy the attention. The photo above of Willie is available in a Limited Edition Canvas Giclee from TigersTime Studios.